Pick some open-source project, probably a smaller one, that does something you’re interested in. Maybe it’s something you tried out and used. Maybe it’s something you tried out and it didn’t work out. Maybe it’s something you looked at and didn’t understand. Report an issue if you had one, even just requesting more information/instructions or pointing out what was unclear. Add to the readme. Build out some documentation. Correct a typeo. Refactor a single function, add comment blocks in the code, standardize code formatting… or if you’re up for it, add a new feature or fix a legitimate bug. Then submit a pull request. 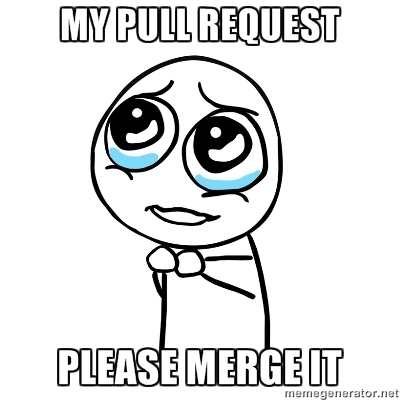 Communicate with other developers to defend your Pull Request. Sometimes they go in and sometimes they don’t, but it’s still great experience and your contributions remain available on your repo (and forks do get seen/used). If this sounds foreign… don’t be intimidated – it isn’t hard. Do it three times and you’ll be totally comfortable. Do it thirty times and you’ll be a much better developer, you will have helped the community at large, and things you use will be improved. 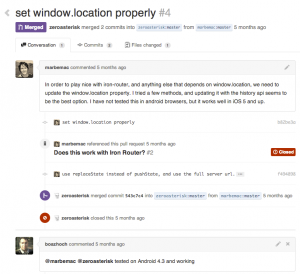 Stick with it and your contributions will be noticed by other developers. Also there is a public history of your contributions which can only help when it comes time to apply for the next job.